I had never been good at talking out my feelings face-to-face. I remember very early on I would write letters to my mom and dad whenever there's something important I needed to tell them. As I'm getting older, I have learned to force myself to learn to talk to them personally. But the thought of writing it all down in a letter -- having the words stare right back at you -- will always seem special to me. 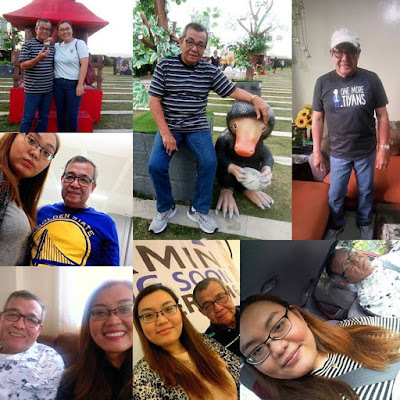 For this year's Father's Day, my dad is not physically able to celebrate with us as he is currently confined in the hospital due to a traumatic brain injury secondary to a fall. I did wish him a Happy Father's Day by his bedside and I know he heard me. But since he is not conscious to comprehend how much love is ensconced in my greeting, here is a letter I wrote. One day, Papa, I will be able to read these words to you and you will hear them, feel them. One day soon after, you will then be able to read these words to yourself and know that your one and only daughter loves you very much. Papa, even though the situation we're in is exhausting, it doesn't measure up to all the hardships and sacrifices that you have made -- you and Mama working together -- for me and my brothers; for our whole family.